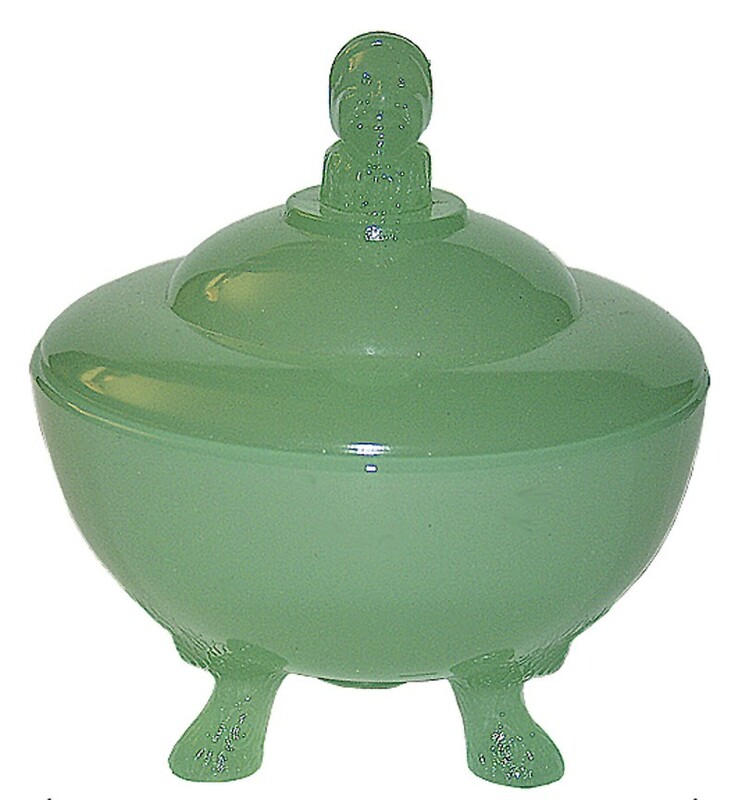 MEASUREMENT: 5 1/2" H. - 5" W.
CONDITION: The Beaumont Glass Company produced this Jester Powder Jar in Jade Clambroth. This jar has been found on this base and also on another round base with tab-like feet. Our lovely jar is in Undamaged Condition without chips, cracks, or mold damage. The jade clambroth color is beautiful. This color jar in this style is extremely scarce.Our lovely powder jar is in Undamaged Condition without chips, cracks, or mold damage. The jade clambroth color is beautiful. CONDITION: The Beaumont Glass Company produced this Jester Powder Jar in Jade Clambroth. This jar has been found on this base and also on another round base with tab-like feet. Our lovely jar is in Undamaged Condition without chips, cracks, or mold damage. The jade clambroth color is beautiful. This color jar in this style is extremely scarce. Court Jester II," is a variation of the "Court Jester I" jar, with the shallow round base and tab-like feet. We have only seen this style complete jar in black and jadite, but bases in Moonstone (clambroth) are known. Some of the black jars have been found with platinum trim. This round jar is 5.25" in diameter and 5.5" high. The lid on both styles of "Court Jester" jars is the same. "Court Jester II" has a deep 3-footed base. We have not seen this style base with the "Taussaunt Glass" mark. The maker of this jar was the Beaumont Glass Company of West Virginia. 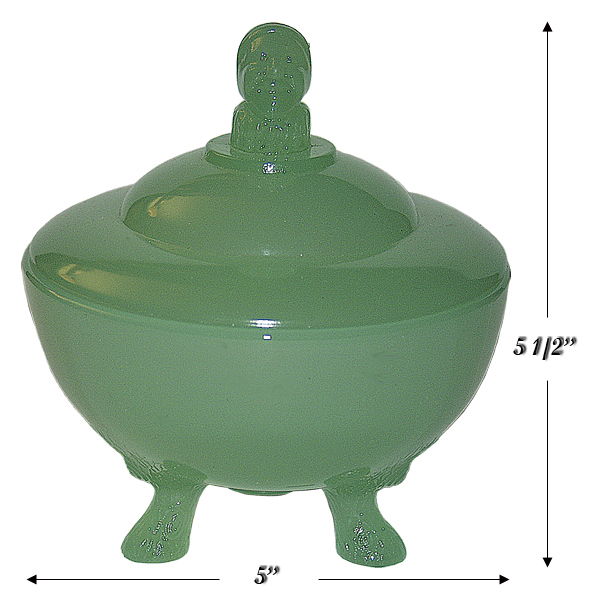 A candy jar with this base and a non figural finial lid was sold by this company.